At the age of 75, and having recently exchanged the title of president of the Alexandros S. Onassis Foundation for that of honorary president, Stelios Papadimitriou lost the battle with lung cancer. His ordeal led to complications that took him to the intensive-care unit of the Onassis Cardiology Hospital, where he died on November 23. The hospital, which was created by the foundation, was inaugurated by Papadimitriou and the two vice presidents. It was written that he should spend the last night of his life there. His funeral took place on Friday and was honored by the Church, the state, the academic community and many of his colleagues. In accordance with his wishes, the funeral was held at Aghia Fotini in Nea Smyrni, where Christina Onassis’s funeral was held on November 19, 1988. She was buried on the island of Skorpios, next to her father and brother, Aristotle and Alexandros Onassis. The bells tolled mournfully in the bell tower, which is a copy of the one at the church of the same name in Smyrna and which was donated by the foundation in memory of Aristotle Onassis and his two children. On this occasion they tolled for Papadimitriou, Onassis’s closest colleague, whom he employed in Alexandria in 1954, when he had just graduated in law, to deal with the legal aspects of transporting Saudi oil. “Only death will part us,” 54 year old Onassis said then to the 24-year-old lawyer, who subsequently became his legal adviser and later the executor of his will, having acted as a teacher to both Alexandros and Christina, at Onassis’s wish. Onassis never got over the death of his son, who died in 1975, and he left half his fortune to establish the Onassis Foundation to undertake a multitude of cultural activities in Greece and abroad. Papadimitriou is gone but his work will be maintained by his son Antonis Papadimitriou (president), Yiannis Ioannidis (vice president), and Giorgos Zambelas (secretary). The service was conducted by Patriarch Theodoros of Alexandria with the participation of Archbishop Christodoulos of Athens and All Greece, Archbishop Anastasios of Albania, and Bishop Ioannis of Pergamum, representing the Ecumenical Patriarchate. Interior Minister Prokopis Pavlopoulos, representing the prime minister, delivered a eulogy, as did Professor Georgios Babiniotis, rector of Athens University. Antonis Papadimitriou made a moving speech about his father as a parent and as president of the foundation. Former Minister of Culture Evangelos Venizelos represented opposition leader George Papandreou. Among those who sent wreaths were the prime minister, the former king Constantine, and Athens University. Papadimitriou leaves his wife Alexandra, a teacher, who is also from Alexandria, and another two sons: Giorgos, who is in charge of engineering for the foundation, and Dimitris, a prominent composer. The large crowd that attended was a measure of the love with which the deceased was regarded. His burial was at the Faliron cemetery, near the sea that linked him with Onassis forever. Stelio Papadimitriou was born in Alexandria Egypt, in 1930. He graduated from the Tositsas Public School for Boys and the Averoff High School of Alexandria. In 1953 he received a degree in law from the University of Alexandria. In 1954 he met Aristotle Onassis who entrusted him with the legal handling of the project for the transport of all of the Saudi Arabian petrol. For this purpose he settled in Saudi Arabia during the years 1954-1960. He was one of the authors of important statutes of the Saudi Arabian maritime law. There he met Michael Dologlou and other associates of Onassis in the shipping sector with whom he established an enduring friendship. In 1960 he returned to Alexandria where he practiced law at an important law office specialized in maritime matters. 1n 1966 he settled with his family in Greece and first lived in Piraeus and then in Paleon Faliron. The same year after exams the Law School of the University of Athens recognized the parity of his degree and he was registered as a member of the Pireaus Bar. From 1967 he practiced as a lawyer and from 1977 he collaborated with his son Anthony Papadimitriou at the law office “S. and A. Papadimitriou and Associates”. Between Aristotle Onassis and Stelio Papadimitriou developed a strong bond both in business and as friends which, lasted until the end of Onassis’ life. 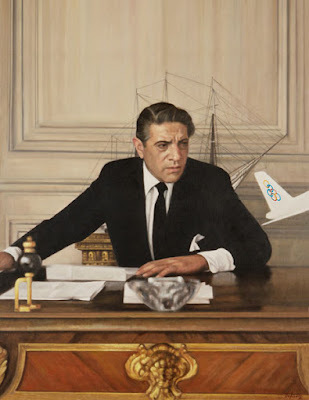 It is indicative that in 1970 when Stelio Papadimitriou was only 40 years old Aristotle Onassis respecting his integrity but also his professional expertise, appointed him, among others, as Legal Advisor and member of the Board of Olympic Airways, President of Olympic Aviation and member of the Board of Directors of his private bank, Bank de Depots in Geneva. At this stage he met with Paul Ioannidis, Apostolos Zambelas and Paraskevas Ioannidis who were executive in Olympics with whom he developed a brotherly friendship. A little later Onassis appointed him with the general management of his fleet which at that time amounted to seventy ships, mainly tankers. Together with his professional occupation with the Onassis group he continued to practice law and became one of the most knowledgeable handlers in complex matters of commercial, maritime, but also in civil law. His office handled the cases of some of the most important names in shipping and in the industrial world of Greece. Stelios Papadimitriou enjoyed such trust and respect from Aristotle that he entrusted with the professional formation of his son Alexander. Until the time of his death Alexander Onassis consider him as one of his tutors. After the loss of Alexander, Onassis chose Stelio Papadimitriou together with Paul Ioannidis to defend and advice his daughter Christina. Stelio Papadimitriou drafted the will of Aristotle Onassis based on his instructions. Onassis appointed him as one of the five executors of his will with which he left, half of his fortune to the ALEXANDER S. ONASSIS PUBLIC BENEFIT FOUNDATION, in memory of his son. The will of Aristotle Onassis also appointed him as one of the initial 15 life members of the Foundation. With Christina Onassis as its first President, he served the Foundation initially as Secretary General, and then as its Vice President and as President of the Executive Committee. At the same time he was elected as President of the Board of Directors of the Holding Company that controls all the commercial activities of the Foundation. After the death of Christina in 1988, he was elected as President of the Business Foundation and then as President of the Public Benefit Foundation. Christina appointed him in her will as a member of the five-member committee that managed the fortune of her daughter Athina Roussel from 1988 to 1999. During his Presidency, the Business Foundation multiplied the initial capital that Aristotle Onassis had left in his will. Among other activities during that time was the planning and implementation of the renewal of the entire fleet of the Foundation and the purchase of important realty among which the Olympic Tower in New York. Thus the Onassis Foundation is today one of the major public benefit foundations in Europe. Among the major activities of the Public Benefit Foundation during his presidency where the construction and equipment of the Onassis Cardiac Surgery Center which was donated to the Greek State, the founding and the running of the Onassis Cultural Center in New York, the programme of Scholarships for Foreigners, the programme of scholarships for Greeks in Greece, the programme of Visiting Professors etc. The undergoing construction of the “House of Letters and Arts”-which is expected to be completed by the year 2008-would have been the crowning of his career. In 1953 Stelio Papadimitriou married Alexandra Crassaris with whom they had three sons. Anthony Papadimitriou lawyer and the current President of the Alexander S. Onassis public Benefit Foundation, George Papadimitriou Civil Engineer and Dimitri Papadimitriou music composer and manager of the Third Programme of the Greek National Radio.